I first saw this picture as I was browsing my Facebook news feed last week posted by pinoyfitness.com in their Facebook page. I was in awe as I double-checked what was written in the poster. Yes, it’s for real and it’s official! 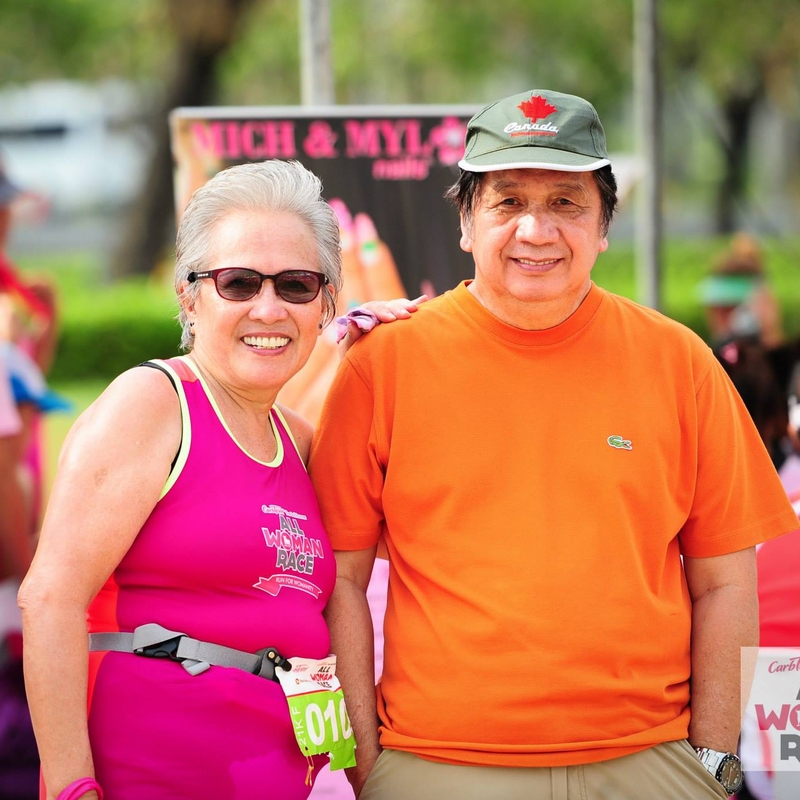 At age, 67, Rosalinda Ogsimer is possibly the oldest woman marathoner in the Philippines today. Her story caused quite a stir that I wanted to get to know her more. I asked if I could feature her in this blog through an interview which she graciously accepted. Can you kindly give us a brief introduction about yourself? I’m a housewife. I do help my husband manage his dental clinic, his personal secretary and “money”-ger. Hehe! To finish my first 42km run, which I did last Feb 22, became my passion. I love cooking for my kids and apos who always visit us every weekend. I started running May of 2012. The first race I joined was the Greenfield Run and I did 5km. Can you share with us your journey as a runner? What urged you to run and how long have you been running? My eldest son, Jon, was the one who asked and encouraged me to join them in their runs. I was 65 when I started running. My son, together with his wife Nellie, and their kids would fetch me from our house so we could go to Manila Memorial Park to train. I wouldn’t consider myself active and fit back then so you would understand my hesitation. At my age, I couldn’t imagine myself running long distances. But my son was insistent and napapayag na rin nya ako. The same with my other children and the rest of the family. Every Sunday we would train together. Have you encountered any struggles and difficulties when you were starting out? How did you overcome them? Yes. Masakit ang buong katawan, may cramps pa! To overcome the pain, you have to practice religiously and accept it that you’re doing this for yourself, for good health. You also need to enjoy it. Pag naumpisahan mo na, hahanap-hanapin mo na. How was your first marathon(or half marathon) experience? My first marathon, The Bull Runner(TBR), I was so happy and blessed that I was able to finish it. A lot of young ones were inspired when they saw me. Lalo na pag nalalampasan ko sila. Maririnig ko na lang, “Takbo tayo, nakakahiya naman.” Nakakataba ng puso na marinig mo ang sigawan ng lahat ng madadaanan mo. What was your most memorable experience as regards running? Running has now become part of our lives. When I joined TBR, I had a great experience. It’s a great experience to finish strong. How do you prepare for your runs? What does your training look like? We do our training every other day. 3 times a week. Every Tuesday 5km, Thursday 10km, Saturday or Sunday 16 or 21km. What was the longest run you’ve conquered so far? Last Feb 22 was my longest run. TBR- ULAH Dream Marathon 2015. What advice can you give those who want to start to run and to all the runners in general? You have to enjoy what you are doing and practice regularly. We run as a family. Three generations. My children and grandchildren. Running is part of our lives already. My grandchildren, Christopher 9y/o and Tyson 10y/o are certified sub1 and sub2 runners. Running as a family makes everything more enjoyable. My dream is for all three generations from my family run in a full marathon together. Hopefully, when they get older and become qualified, I am still able to join them. What is running for you? Running is a way of life which brings us closer as a family. Rosalinda Ogsimer is a living testimony that age is just a number when it comes to running. Indeed, it’s never too late to dream! Did you ever want to start something? What’s your excuse? Be inspired as we relive the moment of how our 67-year old marathoner journeyed her first ever marathon. I Ran for a Hero. I Conquered the Skyway: My First Full Marathon (42K) Experience! March Nacino is known as “The Radical Runner” in the running community. He basically loves to join marathons. When he’s not training for his next big race, he works as a freelance Digital Marketing Specialist helping his clients with their Digital Marketing needs. Follow March at theradicalrunner.com. You are the brand March! Rosalinda is my new idol! Her journey is so inspiring. And I thought I was the oldest to run when I run my first 5K at age 50. I so envy her because they run as a family. I accompany my kids when they join 5K races but I know they just do it to please me, not beause they really like it. Would you know the oldest female 50K runner? How about 80k? I want run UPLB to UP Diliman but I’m not sure if I can finish it. I am 57. Hi, Nora! Thanks for dropping by. Indeed, Tita Rosalinda is such an inspiration. Good to know that you’re also a runner. Re the oldest 50K and 80K runners, I don’t have any idea yet. But, would love to feature them here as well should I get the chance to meet them in the future.